Betty D. DeMunn is a professional actress and free lance writer who lives in Buffalo, New York. She's been addicted to Ataris since 1982, when a 400 followed her home one day, and grew up to be a 520ST. Other hobbies include: one husband, five children, seven grandchildren, and one great-grandson, Nick. Wow. The term user-friendly is painfully overworked, so I'm calling LabelMaster Elite tail-waggin', hand-lickin', roll-over user-affectionate! Within minutes of booting, I was merrily spinning change-of-address labels for my daughter, hilarious (to me) mailing labels for friends, and a couple of tidy disk labels to replace the messy ones I've been trying to decipher. Credit is largely due to the straightforward, "A-B-C" manual which "tells it like it is"—a rare advantage for those of us who are not techies, progies or hackies. Now, let's get up close and personal. LabelMaster Elite is GEM based, with pull-down menus, mouse or one-stroke keyboard commands. The mailing list manager allows you to define business or personal records. Personal records have three lines of print; business records have four, allowing you an "Att:Name" on top if you wish. Both have an additional forty-character comment line which can be printed or not. It's nice for recording salient facts. Or rude remarks. Or clever slogans. There is room on the disk for about 1400 records, and, as LabelMaster Elite is not copy protected, you're not limited in storage capacity. If you run out of record room, just copy a new disk or trash some unnecessary files. Some of the word-processor functions are: search, delete, modify, and sort on first or last name, address, city, state or zip. There is a feature that allows you to print "freestyle," meaning you can mix type styles and pitch on the same line for emphasis or aesthetic satisfaction. And you can print up to 999 labels at a whack. Print entire files of "personal" or "business," or both. With or without a design. 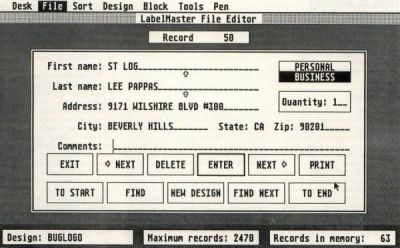 LabelMaster Elite keeps track of the number of records in a file as you go, and lets you know how many blanks are left. Indeed, the authors have paid meticulous attention to detail. Careless or lazy typists will appreciate the automatic comma between city and state, the capitalization of the two-initial state abbreviation and the caret-defined parameters of the working label. This latter feature keeps the printing from oozing off the right side of the label, and saves counting letters. The cursor arrows (or mouse) move you around the record quickly, and a double row of buttons give you options such as forward or back in the file, exit, change design, delete, etc. There's even a print button for one label, just for practice or preview. The creative challenge of LabelMaster Elite is in its graphics editor. Supplied with the program are about eighty ready-to-go designs covering a multitude of subjects, most of which are extremely well done. And there's space to stow plenty of your own creations. When you click on a specific design, you can innovate to suit your wildest urges. Pull down the "Pen" menu. Now you can "draw" in black, white, or gray (checks). Or choose "Point," to plunk one dot at a time on the screen. When you edit your design, you can move it up, down, left or right. It wraps. Erase what you don't want. Vertical flip, horizontal flip, and invert are other options under edit design. Wait, there's more! Under the "Tool" menu: frame, circle, square, box, line and mirror. What more could you ask? Oh, so you want a block menu? Okay. LabelMaster Elite gives you a clipboard, so cut-and-paste, copy and move blocks to your heart's desire—in replace or transparent modes. And, if that's not enough, there's a modern capital font called Broadway, for elegant initials. An unexpected bonus: LabelMaster Elite is compatible with Print-Master graphics. One of my favorite features is the 3½-inch disk label setup. Choose normal, wide or condensed print. Place your icon or drawing right, left or center of label. You can select triple-width for the graphic, then print up to seven lines of text, including the title, on the upper edge of the disk. 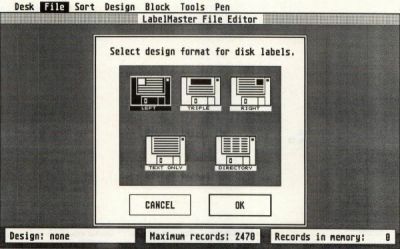 And, if you want a disk directory, LabelMaster Elite will print that too. The applications of this program are virtually endless. Try running the graphic through in one color, and the text in another. Make gift stickers, ID labels for practically anything and everything: loaned articles, name tags, packages, books, canning labels, spice jars, records, albums. And what fun for holiday card mailing labels! Or print a message on one side of 4×6-inch cards (up to ten lines of text without design), then turn 'em over to print your mailing list for special announcements or reminders. My peerless 520ST is new, so I'm being very selective about the software I buy for it (for a change). As you may have guessed, I'm quite pleased with Label-Master Elite, its authors, Migraph—and myself, for choosing it. This is one time you can read the plentiful information on the package and be assured that it will do what it says it will. In addition, Migraph is that rare breed of software company that won't ignore you once the warranty card is in. From personal experience, I've found the folks there friendly, helpful and quick to respond. You don't often find a workhorse and a toy in one package. Migraph listened to its customers, acted upon constructive criticism, and came up with a powerful program that takes plain old boring labels and transforms them into eye-catching, attention getters. Although I have stressed home use, this would answer the needs of small business very nicely. Important! Registered owners of the original LabelMaster (you did remember to send in that warranty card, didn't you?) may upgrade to LabelMaster Elite by sending the original master disk, plus $5 to Migraph. Your data files can be easily converted to the new version.